I’ve been remiss in doing some celebrating and reflecting (beyond what I do every day) about the history of my favorite toy line. As we near the end of this 50th anniversary of the first action figure, I began to think it would be a nice thought experiment to pick out 50 of my favorite items from GI Joe’s 50 years. I’m breaking it up according to Joe’s transitions through the decades, just to make sure I represent the entirety of the line. Today, it’s the 64 to 78 era, covering the birth of the brand through its transition from a realistic military toy to the Adventure Team, Super Adventure Team and the short-lived Super Joe. Granted, I haven’t covered a lot of this era during the last few years, but I’ve an appreciation for it, no doubt. I’ve mentioned in the past that for a time, I was heavily into collecting the 64-68 era. Unfortunately, I sold off all of my older Joes to help make ends meet during my college years, and I truly miss the old guys I had in the collection. But enough of my bellyachin’. From footlockers and fuzzy heads to o-rings and code names, it promises to be a fun ride. Let’s go! Action Soldier – You just can’t mention the first era of GI Joe without the original Mr. 7500 action soldier himself. The prototype for the series, he is the quintessential grunt. He’s also the beginning of the razor and razor blade concept that carried through the brand for many years. Once you buy Joe, you need to equip him. That means everything from weapons and gear to vehicles, compatriots and (later) foes. When I dipped my toes into the 60s era back in 1992, this was the first figure I bought; a pristine example in an excellent box. There isn’t much since that compares to the original, in terms of historical importance and sheer coolness. Action Solider (black) – Although the figure is simply the Caucasian head molded in a different color, the fact that a toy was marketed to African-American children is significant for its time. Diversity is good. 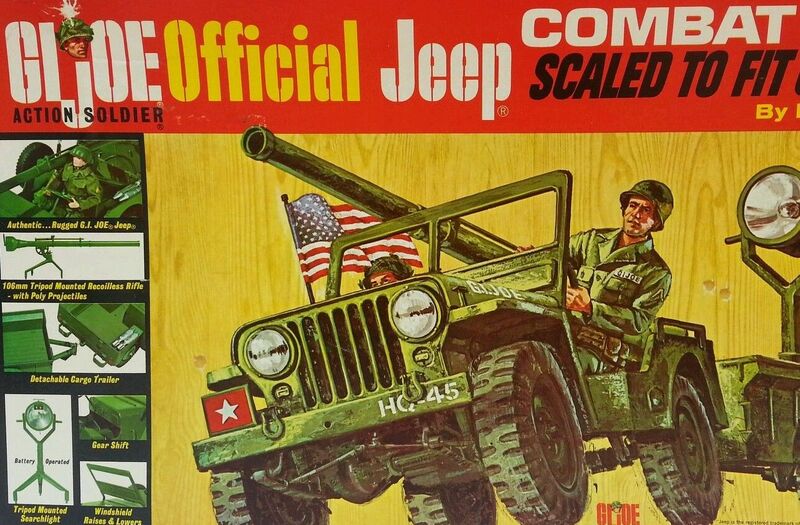 Combat Jeep – The first GI Joe vehicle, and the beginning of what has become a legacy of fantastic action figure rides. If you’ve seen it in person, this is one monster of a toy. GI Nurse – The first female figure in the line, and the first female “action figure”–it’s not a doll–the toy affectionately referred to as GI Jane also opened up the interesting play pattern of battlefield medics. Unfortunately, she was also the first to prove the toy adage that female figures don’t sell. Space Capsule – Another iconic and real world vehicle, the space capsule was also a then-current subject for the toy line, unlike most of the WWII and Korean conflict based outfits and sets from 64-68. Talking Adventure Team Commander (black) – The pull-string talkers were nothing new in the line by the time the 70s dawned, but the Adventure Team seems to be so easily identified with this feature. Maybe the striking box art was the reason. After all, what could beat a masterful painting of a man shouting to sell a toy? Again, Hasbro continued to market African-American toys, and having a black talking commander was a very positive move. Adventure Team Vehicle – GI Joe has always had the sweetest rides in all of toydom. Sure, Barbie has a veritable fleet of personal transportation, and Star Wars has its share of iconic people movers, but GI Joe brings out the best in realistic, near future and “I can’t believe that doesn’t really exist” equipment. The Adventure Team Vehicle is a prime example. Even Joe fans of my generation have a soft spot for this six wheeled yellow icon of the 70s. I want one in small Joe scale, and heck, I also want one I can drive too. Bullet Man -As Joe faced competition in the boys’ toy aisle, things began to move in strange directions. The Adventure Team added a Super to its moniker, and colorful superheroic fellows like Bulletman joined the team. Reviled and loved depending on one’s sensibilities, there’s no denying his toyetic talents. Who knew that super heroes would become all the rage. Maybe Hasbro was prophetic in that sense? Then again, maybe they just wanted to try to take a bite of Mego’s super profits. 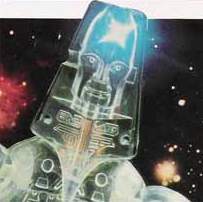 Luminos – If the Human Bullet wasn’t far enough removed from the stoic and simple action soldier of the line’s genesis, Super Joe took things into the stratosphere of sci-fi and apparently into the far future. For someone like me, whose tastes run the gamut from an appreciation of the realistic to the out and out “toy for the sake of toy,” the short-lived line is a treasure trove of fun and funk. Luminos stands out as my favorite, incorporating both clear plastic and a light-up action feature. What’s not to love, aside from the fact that every single figure is now a pile of parts thanks to deterioration of the joints. There is however a way to repair these odd denizens of Joe’s most forgotten era. Wow, it’s already been a whirlwind covering one section of the 50 year history of the brand. Again, I’ve not tried to compile a list of the greatest, but rather the items that have struck my fancy over the years I’ve been collecting. Stay tuned, because tomorrow we pick up with the birth of the small Joe era, and even come full circle with the return of the big guys. Hold on tight! I wonder why, of all superheroes, that Bulletman–an obscure character from Fawcett Comics, then-revived by DC at the time–got brought over to GI Joe? My Dad loves Jeeps [he really wanted to name me “Jeep”]. I’ll see if i can track one of those 60’s Jeeps down for him. This is my first time seeing Luminos. Great idea, and great writing! Love it! Nice list you’ve got going! I’ve learned a lot about ’70s Joe here. This would be a fun exercise to make my own list – but maybe just a top 10.